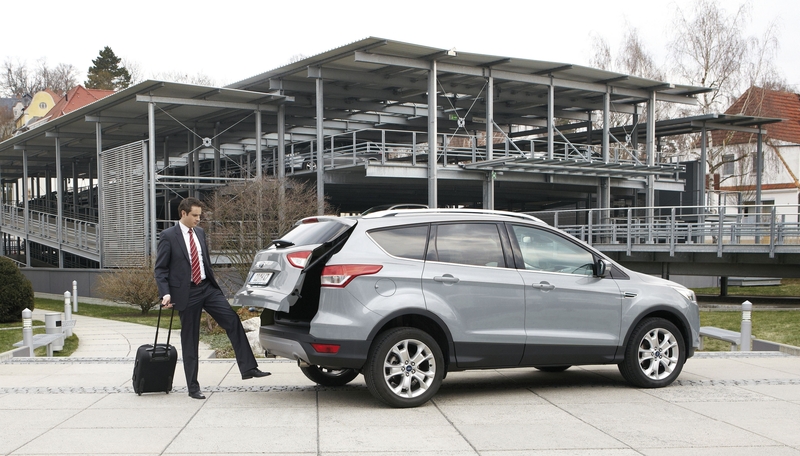 A simple foot movement below the bumper is all it takes to automatically open and close the liftgate. If desired, this feature can be connected to the cargo area cover, thus providing access to the cargo area as the liftgate opens. In addition, the opening angle of the liftgate can be individually programmed to fit the respective garage height. With its system for hands-free opening and closing of liftgates and trunk lids, Brose is leading the way to a new dimension of comfort features. The prototype made its debut at the IAA 2009; by 2013, it has been fitted into twelve models manufactured by three OEMs. In addition, the innovative solution has already won two noted awards: the "BMW Supplier Innovation Award" in 2011 and the "Pace Award" in 2012, one of the most prestigious awards of the US automobile industry. However, the supplier's expertise in mechatronics engineering goes far beyond this technical feature: Brose is showcasing a complete system for intelligent cargo management with capacitive sensors for anti-trap and collision protection at the IAA 2013 for the first time. The concept combines all components relevant for greater comfort and safety in the vehicle rear: drive, contact-free anti-trap feature as well as a low-noise and lightweight liftgate latch with automatic soft-close function. The award-winning sensor system for hands-free opening and closing of the liftgate and, optionally, the cargo area cover makes it much easier to load and unload the vehicle. All components are developed by Brose in-house. Thanks to the perfect synchronization of the system components, the supplier achieves minimum noise emissions and substantial weight savings of component parts. The electric spindle drive ensures the low-noise opening and closing of trunk lids or liftgates. In addition to significant cost benefits, the latest generation of these drives provides carmakers with maximum design freedom: the standardized drive can be installed in all vehicle models and across all platforms. Brose provides solutions for all designs and load ranges, with assembly variants in the water channel, behind the side trim panel or below the roof, optionally available with tension spring or compression spring as well as overload clutch or brake function. The drive comes in either a steel tube designed to optimize package space or in a weight-optimized and cost-efficient plastic tube. Depending on the vehicle type and liftgate weight, the spindle drive can also be fitted on just one side of the liftgate. In this case, the passive side is supported by a spring strut, which appears identical to the active side with the spindle drive thanks to the steel or plastic tubes. This provides additional weight savings of 15 percent and also reduces costs and noise emissions: with noise emissions 3 to 5 dB(A) lower than the current series, Brose's one-side spindle drive is one of the quietest of its kind available on the market. In electrically powered liftgates, the anti-trap feature reacts only in the event of contact. To entirely prevent a collision, Brose has developed a direct sensing anti-trap function based on capacitive sensors that recognizes obstructions without contact and stops the liftgate from closing before anyone becomes trapped. At the IAA 2013, the supplier is showcasing the various assembly options of the sensor systems that can be invisibly integrated in plastic or metallic liftgate structures. Integrated in the bumper, an additional capacitive system facilitates loading and unloading the vehicle without using a key or setting down luggage. All it takes is a simple foot movement to open and close the liftgate. The sensors can also be linked to the cargo area cover, which then opens and closes at the same time as the liftgate. Thanks to the electronic control, the liftgate can be stopped at any position by pressing the button, thus reducing the risk of damage in low garages. The maximum liftgate opening angle can be individually programmed with the remote control. The platform latch integrated into the overall system features outstanding acoustics and a low weight: equipped with a cable actuator, it opens more silently than any other commercially available liftgate latch. Weighing just 400 grams, it is also around 30 percent lighter. The closure system also comes with an automatic, sound-optimized power cinching unit that has been proven in series production. Requiring little application effort, the closure system can be easily adapted to fit individual interfaces, geometries and mounting angles: the different latch variants for trunk lids or liftgates – with or without power cinching – are compatible.